A couple new things for the weather inclined. (beside winds) like pressure and temperature. to be downloaded along with winds. of winds. Surface temperature is also important. printed as wind texts or plotted as fields (see below). Pressure is in milibars and surface temperature in deg Celsius. - Fields - Fields visually represent a weather variable in a given area. Fields can be made of vectors (p.e. wind arrows) or scalars represented as color gradients. can impact chart rendering performance ( a value of 0.2 degree for field resolution is suggested ). While smooth color gradients look nice, non-smooth show the field contours clearly. Your choice. wind colors, pressure colors, temperature, land coverage. 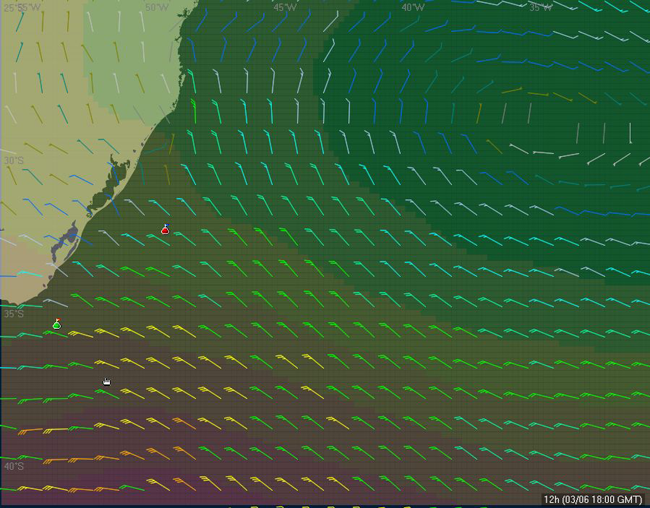 If wind interpolation is on, weather variables are also interpolated. Fields can be added and edited in the "Marks, Circles, Fields" group. To create a field, set properties and click [Add field] . This will add a field covering the current viewport area. 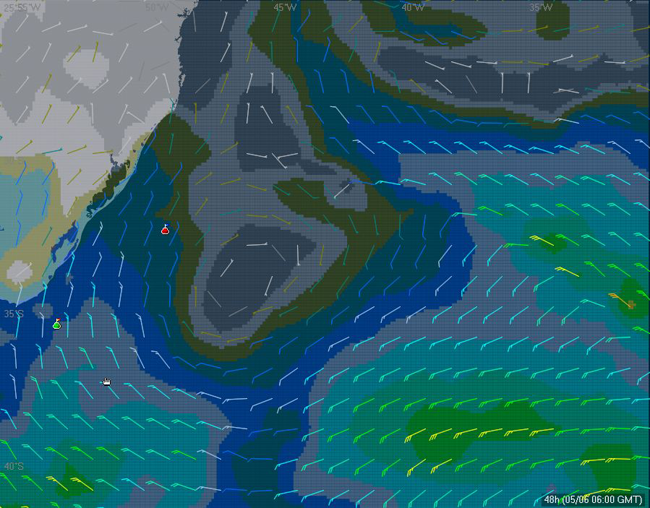 I added wind barbs, the way meteorologists are used to represent winds. a half barb is 5 knots and a flag corresponds to 50 knts. Wind speed is easy to figure by counting the barbs. and are not centered, but positioned to point the wind location. perform well around islands and capes. - Corrected issues with grib files imported by ZyGrib and UGrib. ZyGrib and UGrib have their own servers producing compact grib 2 files. ZyGrib files are further bz2 compressed. These programs save the grib files to hard disk (Gribs contain the wind forecasts and other meteorological variables). You can load those gribs in VRTool, using the NOAA import module. 1- Click [Load] and select the file. Choose the file and click [Ok]. 2- Click [Use Winds]. This will add the grid to vrtool desktop. servers can be difficult if the connection is slow. Also, by re-using the files, you save satellite bandwidth. Wind color field is similar to previous colored rectangles, but with higher resolution.